Throughout history, dark and reactionary forces have always attempted to control the world; by violence, by deceit, by kidnapping and perverting the mainstream narrative, or by spreading fear among the masses. Consistently, brave and honest individuals have been standing up, exposing lies, confronting the brutality and depravity. Some have fought against insane and corrupt rulers by using swords or guns; others have chosen words as their weapons. Many were cut down; most of them were. New comrades rose up; new banners of resistance were unveiled. To resist is to dream of a better world. And to dream is to live. The bravest of the brave never fought for just their own countries and cultures; they fought for the entire humanity. They were and they are what one could easily define as “intuitive internationalists”. Julian Assange, an Australian computer expert, thinker and humanist, had chosen a new and mostly untested form of combat: he unleashed an entire battalion of letters and words, hundreds of thousands of documents, against the Western empire. He penetrated databases which have been storing the evidence of the most atrocious crimes the West has been committing for years and decades. Toxic secrets were exposed; truths revealed. To those who have been suffering in silence, both face and dignity were finally returned. Julian Assange was a ‘commander’ of a small team of dedicated experts and activists. I met some of them, and was tremendously impressed. But no matter how small in numbers, this team has been managing to change the world, or at least to give the Western public an opportunity to know, and consequently to act. After WikiLeaks, no one in New York, Berlin, London or Paris has any right to say “we did not know”. If they do not know now, it is because they have decided not to know, opportunistically and cynically. Julian Assange and his comrades published all that the West was doing to the Afghan people, as well as to those suffering from neo-colonialism and imperialism all over the Middle East, Africa, Asia and Latin America. What is it that the critics of Wikileaks are holding against Mr. Assange? That the snitches and the agents of the Western empire got ‘exposed’? Is the world expected to feel pity for them? Are tens of millions of victims supposed to be forgotten just so that the members of the Western intelligence services and their lackeys could feel safe and protected? A few days before this essay went to print, Julian Assange was cynically betrayed by a country which used to be governed by a socialist administration, and which gave him political asylum and citizenship, both. Its current ruler, Lenin Moreno, will be judged extremely harshly by history: he’ll be remembered as a man who began dismantling the socialist structure of Ecuador, and who then literally sold (to the twisted British and US judiciary systems) a man who has already sacrificed more than his life for the truth as well as for survival of our planet. 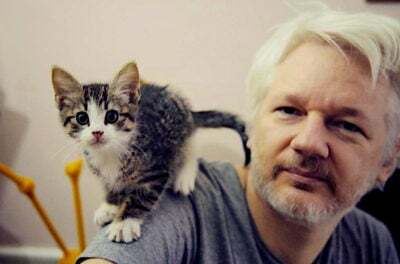 As the Metropolitan Police dragged Julian Assange from the Ecuadorian embassy in London into a van, the entire world could catch a glimpse of the naked essence of the Western regime; the regime in action – oppressive, gangrenous, murderous and vindictive. But we should not forget: the regime is not doing it because it is confident and strong. It is actually terrified. It is in panic. It is losing. And it is murdering, wherever it feels ‘vulnerable’, which is, all over the world. Why? Because the millions, on all continents, are waking up, ready to face Western terror, ready to fight it, if there is no other way. It is because they now know the truth. It is because the reality cannot be hidden; the brutality of Western global dictates is something that no one can deny any longer. Thanks to the new media in countries that have managed to free themselves from Western influence. And of course, thanks to heroes like Julian Assange, and his comrades. Julian Assange has not fallen. He was stabbed, betrayed. But he is here, he is alive, with us; with the millions of those who support him, admire him, and are grateful to him for his honesty, courage and integrity. He confronted the entire Empire; the most powerful, evil, destructive and brutal force on earth. And he managed to damage its secret organizations, consequently spoiling some of the plans, therefore saving lives. All this can be considered a victory. Not the final victory, but a victory nevertheless. By arresting Assange, the empire showed its weakness. By dragging him from the embassy into a police van, it has admitted that it already has begun sewing its own funeral gown. WikiLeaks founder Julian Assange has been given an award established in honour of an assassinated journalist. Assange, jailed last week after being forcibly removed from the Ecuadorian embassy in London, was awarded the 2019 GUE/NGL Award for Journalists, Whistleblowers & Defenders of the Right to Information. It is sponsored by European parliamentarians after being established in 2018 in honour of assassinated Maltese journalist Daphne Galizia. individuals or groups who have been intimidated and/or persecuted for uncovering the truth and exposing it to the public. Nobel Peace prize winner Mairead Maguire collected the award on the Australian's behalf at an event in the European parliament in Strasbourg. Through WikiLeaks Julian Assange's vision of transparency has revolutionalised journalism. His imprisonment and threatened extradition to the United States has drawn a sharp line in the sand. You are either encouraging the crackdown on media freedom or you are standing with Julian Assange. Last year the Galizia prize was jointly awarded to murdered Slovak journalist Jan Kuciak and LuxLeaks whistleblower Raphael Halet. Assange had lived inside the embassy for almost seven years before his diplomatic asylum was revoked. The WikiLeaks owner, Julian Assange, betrayed by his country, Australia, will nonetheless remain a hero of exposing the evil machinations the US-led western powers have been doing and probably continue doing against the majority of the people of the world to serve their unquenching voracious appetite of greed and selfishness. Last edited by Temt on 17 Apr 2019, 20:17, edited 1 time in total. You're correct, brother temt. You & I, see eye to eye as usual.